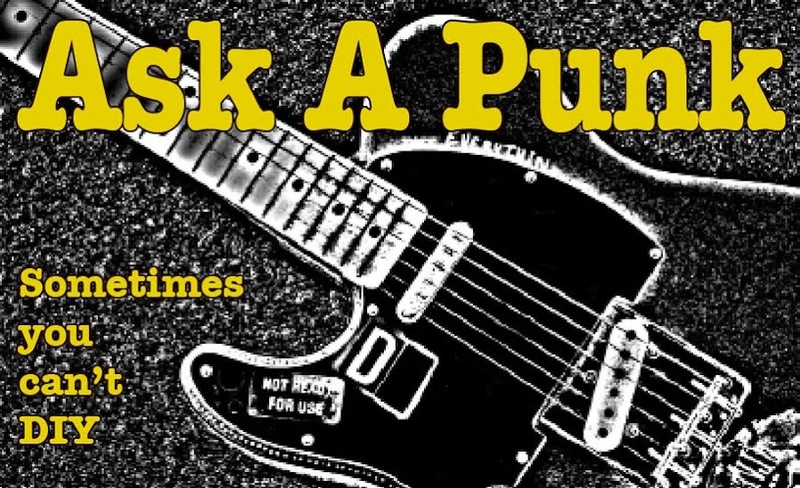 Ask A Punk: Best Band in Town. 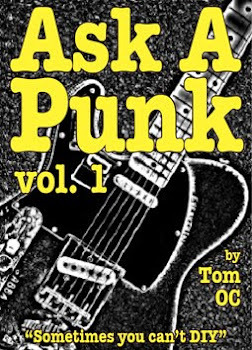 Without a lot of hoopla, I just wanted to point out that today is the 3 Year Anniversary of ASK A PUNK and I wanted to thank everyone who has spent some of their internet surfing time here. I'll keep writing, please keep reading and help spread the word... thanks again! I live in a small town and my band is great. I'm sick of everyone who thinks the only way to be a great band is to move to some big city, find the 'cool' neighborhood and then live like a cockroach while you compete with a 1000 other bands for the same stage time and all that BS. It is just stupid to incur all those expenses just be be cool. My rent is cheap. I have a yard and a dog and I live in a great and safe neighborhood. How many "dudes in bands" living in some big place say that? Not many. And of course with the internet we have access to the same 6 billion+ music fans as any of them do. If some guy in Finland digs my band he isn't going to notice or care exactly where I'm living. So why do people still do it? - Hicks Rock. I'm not going to try to change your mind on this. You make some extremely valid points. I'm a guy who grew up in a small town - I left it and moved to my first "big city" (Boston) for reasons that mostly had nothing to do with bands or gigs and so yeah, even to this day I sometimes miss the ease, quiet and relative safety that comes from living in a less urban setting... but unless your name is Justin Bieber or you're planning a Scandinavian tour, that dude in Finland isn't going to be showing up to one of your gigs any time soon. I love the internet (obviously.) The way it has decentralized power and made worldwide distribution as easy for a small-town band as it was for the major labels is awesome to me, but as much as the internet has enabled bands to reach out further & wider for fans (while dealing that blessed death-blow to the major record labels) the bottom line is this: Most groups want to be a BAND not a 'studio project.' ... and the way to do that has always been to play live gigs in front of an adoring (and hopefully ever expanding) audience. The only way to do that is to go to where the people are... and where do we find great teeming hordes of such potential fans in the flesh and on the hoof? ... in big cities. The bigger the city the bigger the potential fan base. There is a reason that towns of 4000 people don't have rock clubs with an audience capacity of 1500. It is that simple. I also have to say that it is much much easier to be, or perhaps just think you are, a 'great band' in a small town. Spend a year (or ten) playing hard gigs on bills shared with two to six other bands and you'll have a much much better idea of how good, great or awful your band might really be. As far as the 'attitude' you feel you're getting from the majority of 'urban rockers' all I can say is this: Your email fairly dripped with attitude itself... so maybe those people are picking up your hostile vibe and just preempting you. Either way keep playing and enjoy your yard. Maybe next time you run into some City Rockers you'll invite them out to your place for some rural hospitality so that they can see what (you think) they're missing. i'm with Hicks Rock on this one, but s/he forgot to mention the main point about why the suburbs/rural areas are great for making music: without constantly getting caught up with other bands in an urban scene, you are more likely to a) sound original and b) foster real, lasting connections with people. In a less urban setting you may, to paraphrase AAP , think your band is good when in the larger scheme of things it isn't. My thinking is precisely the flipside of this. In a city, whatever the current trend is will repeatedly tell you (if you don't fit into it) that your band is bad. If you seek to be original above all else, it's probably healthier to keep a safe distance from that attitude. Really, it depends on your goals. There are benefits to living in a city, including a greater potential live audience and more sensory input in general. But that input can overload you, and that audience will largely depend on trends, likely hanging you out to dry after the wave passes. In a small community, your band will likely mean more to it's audience, and, if you say something to them that's resonant and original, they'll remember you long after your gone.